For more that two years now Reader Stephen Methodius Hayes and his wife Valerie Katharine Hayes have been worshipping with a small congregation that meets in a classroom at Zakhele Primary School in Mamelodi East. Mamelodi is a former black township to the east of Pretoria. Ten yearsafter the end of apartheid, it is now, with Pretoria, part of the greater City of Tshwane, but it remains a poor working-class suburb. There are no longer laws that prevent white people from living there, or even entering it without a special permit, such as there were in the days of apartheid. People can own their own homes now, instead of having to rent them from the council, and so many have extended their houses, and made them more homely than the matchbox council houses of the past. But the plots of land are small, so there is a limit to how much they can expand. Richer people tend to move out to the wealthier suburbs, and so Mamelodi remains a poor suburb. There we have had the Hours and Readers Service (Obednitsa) with the blessing of His Eminence Metropolitan Seraphim, Archbishop of Johannesburg and Pretoria. The congregation originally belonged to the African Orthodox Episcopal Church, and they were used to a Protestant style of worship. When the AOEC decided to join the Patriarchate of Alexandria and become part of canonical Orthodoxy, we began with the Hours and Obednitsa, which have been partly translated into the North Sotho Language (Sepedi) used by most of the people in the congregation. We could not read North Sotho at all, but some high school pupils in the congregation would read the Psalms in North Sotho, and some of the prayers in both English and North Sotho. We left them tapes of the Resurrectional Troparia and Kontakia for Sundays, and they learnt them. We adapted Russian and Byzantine melodies to the North Sotho texts, and gradually learnt to sing them. In the classroom we put ikons of Christ and the Theotokos on a desk against the east wall, and people learnt to venerate the ikons, to sing the hymns, and read the Psalms. But the classroom was only an approximation of a setting for Orthodox worship, so occasionally we took as many of the congregation as we coupld fit into our car to other parishes, especially the Church of St Nicholas of Japan in Brixton, Johannesburg, where the services were in English. We this at Holy Week and Pascha in 2002, 2003, and 2004. About once every 2 months or so we would take people to the ordinary Sunday Liturgy, especially after two of the older members of the congregation were baptised, so that they could receive communion. We go sometimes to other parishes. The nearest is the Greek Parish of the Annunciation in Pretoria. 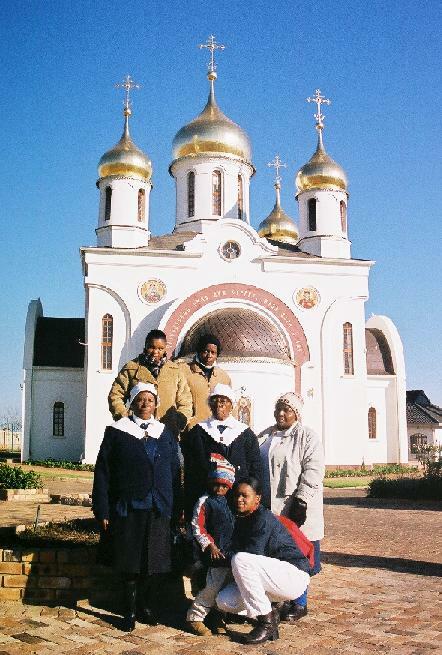 Another, a little further away, is the new Russian parish of St Sergius of Radonezh in Midrand, which was concecrated by His Grace Kirill, Bishop of Smolensk, in March 2003, At the patronal festival of the church, in October 2003, the Mamelodi group was asked to sing the Our Father in English. 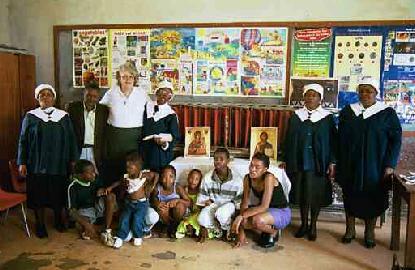 In the Paschal season in 2004 the Mamelodi congregation was asked to sing parts of the Divine Liturgy at St Thomas's Serbian Orthodox Church in Sandton, near Johannesburg, and shared the singing with the local parish choir. We sang in four languages: North Sotho, English, Slavonic and Greek. Mokgethwa yo a sa felego, re gaugele. Orthodox Christian Mission Center - based at St Augustine, Florida, USA, the OCMC sends short-term and long-term missionaries to various parts of the world. The Greek Orthodox Patriarchate of Alexandria - the Orthodox Church in Africa and Madagascar falls under His Beatitude Petros VII, Pope and Patriarch of Alexandria and all Africa. Orthodox mission in tropical Africa - an article on the growth of Orthodox Christianity in tropical Africa since 1920.